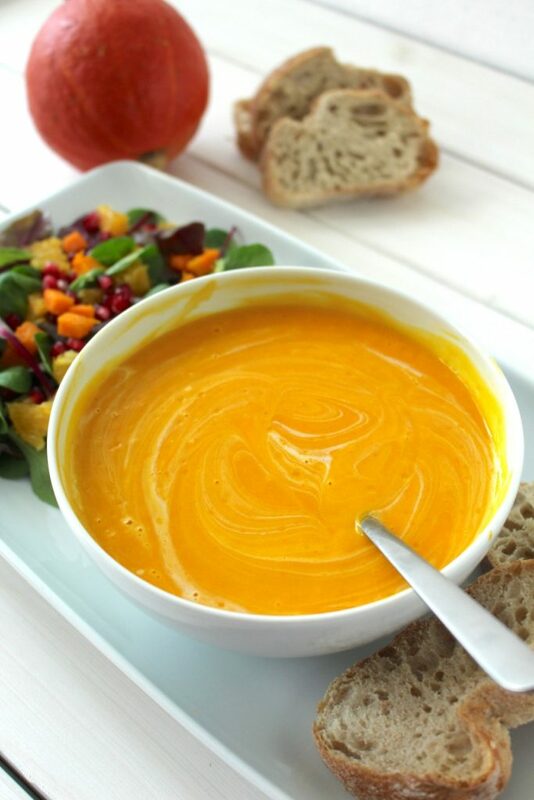 This creamy pumpkin soup is my absolute favorite soup in the winter. Not only is it quick & easy to make, but also foolproof and so delicious. The following recipe serves as a basic recipe which I adapt as the whim takes me. And that’s exactly what I’m suggesting you to do as well. You can’t stand ginger? Or maybe you like using curry as a seasoning? 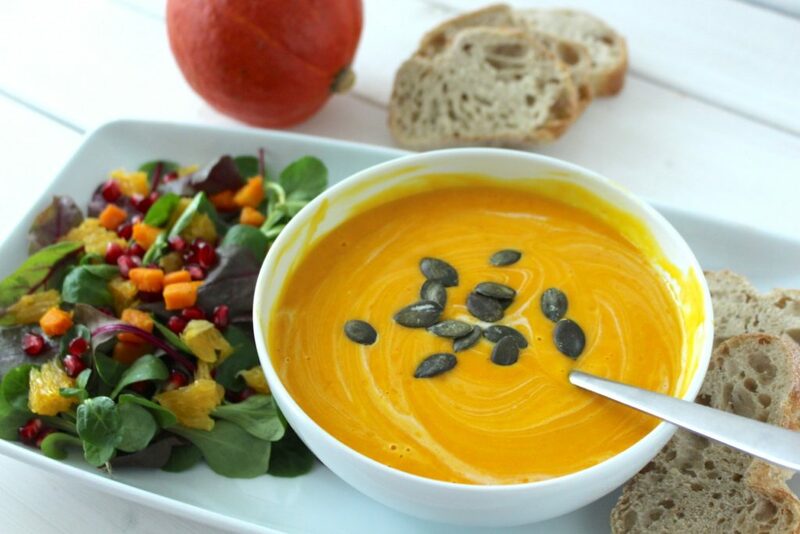 Simply adapt this pumpkin soup recipe to your liking. Just try not to put too much salt in it, since soup usually isn’t very forgiving. 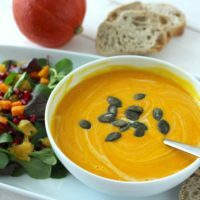 I love having this pumpkin soup together with my favorite warm winter salad, some pepitas and some good bread to dip. 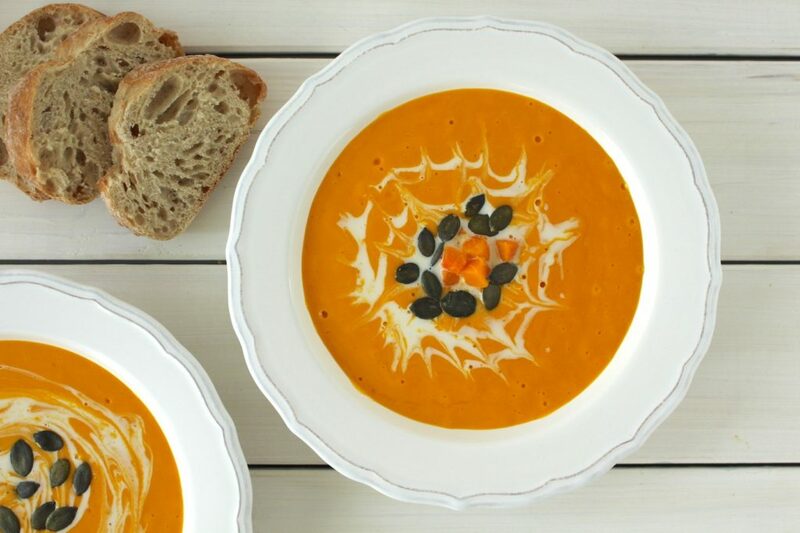 This creamy pumpkin soup is quick & easy to make. It's a foolproof basis recipe for a delicious winter soup that goes really well with a fresh winter salad and some bread to dip. Cut pumpkin in half and remove seeds and fibers. Cube pumpkin and potatoes. In a large pot, cook shallots in some oil (or water) until translucent. Add garlic & ginger and cook for a minute or so. Then add pumpkin and potatoes to the pot and brown for a few minutes. Deglaze with vegetable broth and let simmer for 15-20 minutes until vegetables are soft. Transfer the soup to a blender (you may want to let it cool a little first) or use an immersion blender in the pot and blend until smooth. Return soup to the pot, add orange juice, cinnamon, salt and pepper to taste. Finally stir in oat (or coconut) cream and serve immediately with some pumpkin seeds. There's no need to peel the pumpkin, since the skin of hokkaido pumpkins is edible. Add carrots, curry or anything else to your liking. Make a big batch, as this soup freezes well. I hope you love this recipe – please let me know in the comment section below! If you make this pumpkin soup, make sure to take a photo and share it on my Facebook page or on Instagram, using the hashtag #minamadefood. Oh and don’t forget to tag me (@thisisminamade) so that I can see your creations!